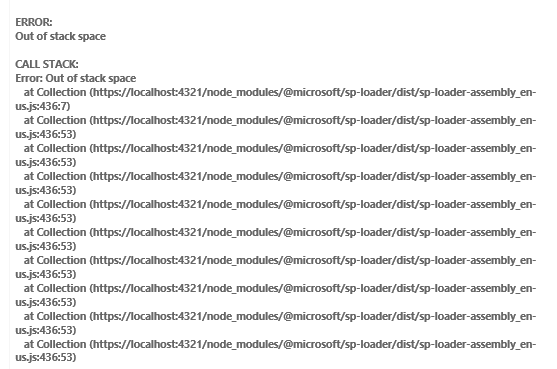 Facing “Error: Out of Stack Space” issue while the Angular SPFx WebPart runs in the IE11? This article helps you to resolve the issue and run the Angular SPFx in IE11. In this article, I am going to provide the steps to fix an issue for the Angular SPFx WebPart to run in the Internet Explorer 11 (IE11). While the Angular SPFx web part runs in the Internet Explorer 11, it will throw the below error. A proper solution to this issue for the SPFx is to import the core-js polyfills in your WebPart. To resolve the above issue, follow the below steps. Create an SPFX WebPart and integrate Angular in your SPFx WebPart. Go to the Node.js command prompt and make sure you are pointing the project directory and running the below command to include “core-js” package in your WebPart. Create a Polyfills.ts file in your WebPart and import the below code in the Polyfills.ts. Step 4 - Import code in WebPart.ts file. Import the Polyfills file in your WebPart.ts file. Now, the Angular SPFx WebPart runs in the Internet Explorer 11. I have attached a sample Angular SPFx WebPart Solution for your reference which has the solution for the IE11 issue. I hope you learned how to solve the "Error: Out of stack space" issue in IE11.